140 pages | 13 B/W Illus. 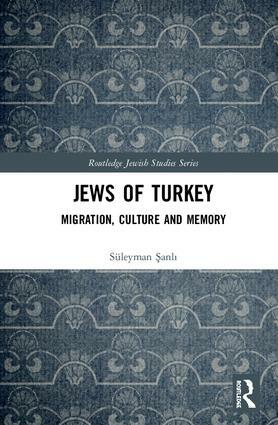 Jews of Turkey: Migration, Culture and Memory explores the culture of Jews who immigrated from East Turkey to Israel. The study reveals the cultural values of their communities, way of life, beliefs and traditions in the multicultural and multi-religious environment that was the East of Turkey. The book presents their immigration processes, social relationships, and memories of their past from a cultural perspective. Consequently, this study reconstructs the life of Eastern Jews of Turkey before their immigration to Israel. The anthropological fieldwork for this research was carried out over a year in Israel. The author visited eleven cities, where he found Jewish communities from the Ottoman Empire. The book examines their history and origins, personal stories of their immigration, and different social aspects, such as their relationships with Muslims, other Jewish neighbourhoods, the family, childhood, status of women, marriages, clothing, cuisine, religious life, education, economic conditions, Shabbat and holidays. This is the first book that discusses multiple Jewish communities living in Israel who moved from East Turkey. The book will be a valuable resource for researchers and students who are interested in Jewish and Israeli studies, Turkish minorities and anthropology. Süleyman Şanlı is the chair of the anthropology department at Mardin Artuklu University, Turkey. He was a visiting scholar at the Moshe Dayan Center at Tel Aviv University, where he conducted the anthropological fieldwork on Jews who migrated to Israel from Turkey. His research interests are, Ottoman Jews, Jews of Turkey, Jewish cultural studies and social and cultural anthropology. Introduction: Invisible or Forgotten Jews of Turkey? 1. Origins and History 1.1 Origin Through Written Sources 1.2 History of the Eastern Jews of Turkey 1.3 Eastern Jewish Communities 2. Migration 2.1 Voluntary Migration or Compulsory? 2.2 Leaving the Forefathers’ Lands Behind 2.3 The Road to Jerusalem 3. Social Life, Culture and Collective Memory 3.1 Jewish Neighborhoods and Jewish Community 3.2 Relationships with Muslims 3.3 Houses of the Jews 3.4 Clothing 3.5 Food 3.6 The Family 3.7 Synagogues 3.8 Death and Funerals 3.9 Economic Conditions 3.10 Education 3.11 Shabbat 3.12 Holidays Conclusion: Become Visible and be Remembered. Süleyman Sanli is the chair of the Anthropology department at Mardin Artuklu University, Turkey. He was a visiting scholar at the Moshe Dayan Center at Tel Aviv University, where he conducted the anthropological fieldwork on Jews who migrated to Israel from Turkey. His research interests are, Ottoman Jews, Jews of Turkey, Jewish Cultural Studies, Social and Cultural Anthropology.